Do You Want to Build a Startup — Or a Small Business? A couple months ago, I officially left my rapidly growing, profitable small business to launch a tech startup with a huge vision and zero salaries. Why did I do this? For me, it came down to the huge differences between a small business and a startup. First off, the biggest difference between these two company types is in their top objectives. Small businesses are driven by profitability and stable long-term value, while startups are focused on top-end revenue and growth potential. Steve Blank’s three-minute definition provides great insight. That remains the best piece of business advice I have ever gotten. Instead of focusing on great products and huge customer bases, I was too focused on dollar amounts — a small-business mentality instead of a startup mentality. I spent the rest of the weekend working with Case on new business models and products, and left these meetings with a grand new business idea. My startup journey led me to launch LabDoor. LabDoor provides report cards for your medicine cabinet. Products are graded based on safety, efficacy, and price. Behind the scenes, technical experts analyze top FDA, clinical and independent lab data that informs the product safety apps. Building this startup has been the perfect opportunity to continue my obsession with science, while greatly expanding the amount of people that will benefit from this research. To be clear, there is nothing wrong with starting your entrepreneurial career with a small business. Building a solid financial base will help create a longer personal financial runway for future startup ventures. Also, establishing a successful small business can build credibility and networks through the business community that will be hugely valuable when launching a startup that requires outside angel and VC investments. But while you do that, be careful not to get too comfortable with a steady paycheck. How do you decide which one is for you? First, ask yourself, what is my tolerance for risk? And what is my tolerance for failure? Because no matter where you are in your life, it is a great exercise to stop everything and visualize your absolute top-end potential. It’s the kind of brainstorming you did as a kid, when you imagined being the President or, even better, an astronaut. Then, start by deciding the biggest problem in the world that you want to solve. Develop your ideal solution to this problem, and then invite your trusted friends and family to poke holes in it. Iterate until you’ve got an awesome idea. If you can build a great team around your awesome solution, now you can stretch one foot into the world of startups. Finally, determine your top objective. Is your long-term goal to build a nest egg or make a dent in the universe? What do you really want out of your life in five years? 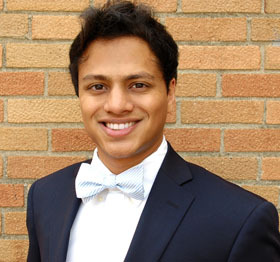 Neil Thanedar is the founder and CEO of LabDoor, a mobile health startup providing consumer-focused product safety ratings. At 24, Neil is the visionary and scientific mind behind a company seeking to replace the FDA and Big Pharma as our top sources of safety information about pharmaceuticals, supplements, and cosmetics. Check out our interview with Neil Thanedar here. Excellent post, Neil. I clicked on the video you linked to. My eyes immediately lit up when I heard Steve Blank explaining the difference between a start up and small business owner. We truly want to make a dent in the universe. It’s a part of our DNA. We can’t help it. Thanks for this great piece.